"If we are what we eat, anyone travelling the highways and back roads of Wellington North Township must be sweet and Canadian at heart. It's hard to imagine otherwise in the land of the Butter Tart Trail, a scenic drive through the small towns and gently rolling countryside north of Guelph, where that most famous of Canadian treats is always temptingly close at hand. " After all, I am Canadian! Several years ago, our family spent some time in Muskoka, a beautiful cottage region north of Toronto. While browsing in the quaint little shops, we came across a cafe that was so inviting, we just had to stop in for a specialty coffee. We discovered a gem of a cafe and found out it was famous for butter tarts, which of course we had to try for ourselves to see what the fuss was all about. 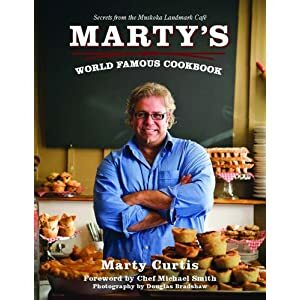 Marty, the owner of the cafe, became famous for his recipes which he had published into a cookbook. When we returned from our vacation, I was delighted to discover that we carried his cookbook at our very own library. Here is the recipe for butter tarts. Sometimes I add 2 tbsps. of white vinegar to the butter tart mixture, if I don't want the tarts to be as sweet. ~ makes approximately 24 tarts. Combine butter, sugar, corn syrup and salt. Heat on medium power in microwave until butter is melted and sugar dissolved. Do not let mixture get too hot, or it will cook the eggs. Add eggs and vanilla, and stir well. Add golden raisins to tart shells. Fill tarts shells - 3/4 full, with mixture. Bake at 450°F for 10 minutes, then reduce oven to 350°F and bake another 10 minutes. I hope you enjoy these recipes Joanne. Mix all ingredients together and beat well. Add walnuts, raisins or pecans....your preference. Fill tart shells. Bake at 375'F for 15-18 minutes. Makes one dozen...so easy, so good!